New York City's RARE Gallery is pleased to announce ". 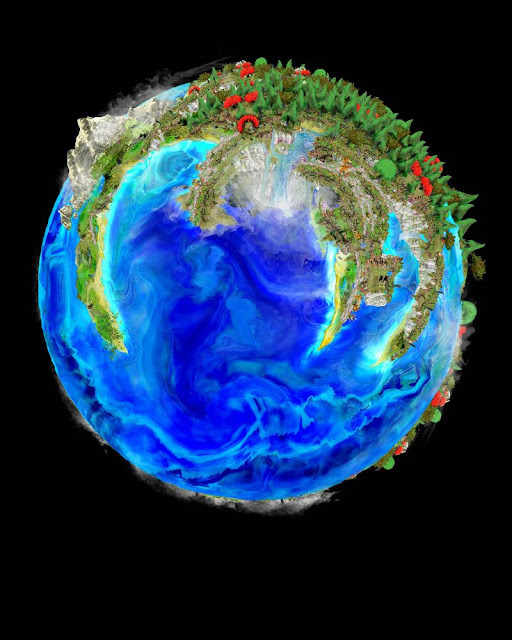 . . all of you on the good Earth," an exhibition of Planets, a series of otherworldly photo-collaged digital images by British/Canadian artist Christopher Rodrigues. The show, which runs from June 30 to August 12, marks Rodrigues' solo debut at RARE. The exhibition's title directly references the Apollo 8 crew's 1968 Christmas Eve address that was broadcast live from the Command Module during lunar orbit as the Earth came into view over the Moon's horizon. Much like the televised images beamed back to Earth during the mission, Rodrigues' focus is on a planetary view of nature, where the entire solar system is home to isolated, Eden-like environments, inherently sick places, and those made uninhabitable because of human interference. With his Planets series, of which nine of the nineteen images are being shown at RARE, Rodrigues seeks to promote the healing of our planet. Each world focuses on a different stage our planetary landscape has passed through or can potentially inhabit. While a small group of planets portrays a balanced setting of water, land, and atmosphere, others reflect a manipulation of these components to create more aqueous, gaseous, or green realms, as well as ones marked by pollution, waste, and scarring. Some planets are more elemental, hardly formed at all, seeming to mimic the birthing process of stars, pure and unadulterated. ". . . all of you on the good Earth" connects the artist's evolving concept of landscape depiction with the environmental issues that concern him. Rodrigues' artistic methods have progressed over the years from traditionally focused painting, drawing, and collage to the utilization of digital imagery and Photoshop which have allowed him to create a unique, pop-up book aesthetic that resembles, yet breaks with, traditional practices for making art. His process is one of searching the Internet for images from which he can borrow pixels of color, manipulating the pixels in a painterly fashion using Photoshop to generate a library of elements (e.g., trees, flowers, rocks, water, clouds), and then assembling them in a collage-like manner to build his planets. The Planet series of "photographs" honors nature while celebrating technology, an important concern in an age when humans are struggling to find a balance with the planet that sustains them. Rodrigues believes that through the proper use of computers we can organize and facilitate solutions to a fair share of today's global crises. According to the artist, while computers have been vehicles for greed that are partially responsible for many of the problems of our time, such as pollution, over-industrialization, and war, they can also be tools for positive change and evolution. Rodrigues studied art at the University of Toronto from 1994 to 1995 and from 1999 to 2001, and at Ontario College of Art & Design from 1995 to 1996. He exhibited twice in 2011 at the Los Angeles Center for Digital Art and the Vivarium Gallery, a window-front gallery he co-founded in Vancouver. In 2010, Rodrigues showed at Port Moodie Arts Centre in Vancouver, the Los Angeles Center for Digital Art, the Hunterdon Art Museum in New Jersey, and The Rymer Gallery in Nashville, TN. The opening night reception is being sponsored by Grolsch Premium Lager.